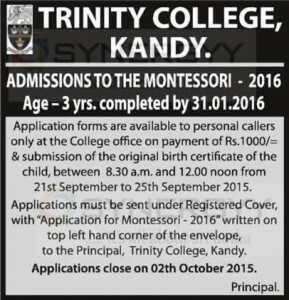 Trinity College, Kandy invites Application to the Montessori 2016 intake. The kid should be 3 years by 31st January 2016. Application forms are available to personal callers only at the College office on payment of Rs.1000/= & submission of the original birth certificate of the child, between 8.30 a.m. and 12.00 noon from 21st September to 25th September 2015. Applications must be sent under Registered Cover, with “Application for Montessori – 2016” written on top left hand corner of the envelope, to the Principal, Trinity College, Kandy. Applications close on 2nd October 2015.